My knitting skills are getting better. I'm trying things I've never tried before, like knitting with seed stitch and using double pointed knitting needles. 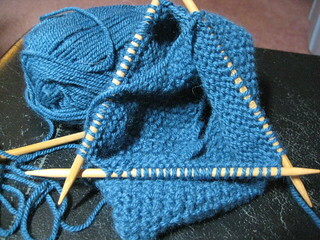 This is a hat that I am knitting for me. So far, so good! I have already discovered the disadvantage of bamboo needles compared to metal. My dog chewed up one of the bamboo needles. Good thing I had 5.